Surrounded by the sacred peaks of Ruapehu, Ngauruhoe and Tongariro, Chateau Tongariro Hotel exudes a timeless elegance deeply rooted in New Zealand’s heritage. Occupying a prime spot in Tongariro National Park, the hotel honours the gracious gift of tribal land to the people of New Zealand in 1887. After a day of Whakapapa skiing or hiking, you can soak up mountain views and classic 1930s atmosphere in our welcoming lounge, savouring High Tea, classic cocktails and live piano music around the crackling fire. A variety of accommodation with National Park views ranges from spacious Family Rooms to Executive Spa Suites, all with tasteful furnishings and decor that reflects the hotel’s notable history. Our convenient, self-catering Fergusson Motel units put you in the heart of Whakapapa Village, where you can mingle with locals at our more casual eateries and Whakapapa bars while still having access to all the hotel services and facilities during your stay. Within the main hotel, the Ruapehu Room serves classic New Zealand cuisine such as lamb, seafood and a delicious signature chateaubriand for two, while a lavish breakfast buffet sets you up for the day. A few minutes’ drive from the front door, you can hike the Tongariro Alpine Crossing or hit the slopes at the Whakapapa and Turoa ski areas. When it’s warmer, get ready for some trout fishing, mountain biking or river rafting. Guests may be tempted to spend all their time at the hotel, with its rugged natural 9-hole golf course, fitness room, lounge billiards, and a beauty and therapy spa. You can even try your hand at Petanque in the garden of Fergusson’s Café, just 50 metres away. If you’re the outdoor type, after a thrilling day exploring the forests and mountains you’ll welcome some relaxation at our inviting plunge pool and sauna. Groups gather easily in our conference rooms, lounge, cinema and conservatory, equipped for business presentations, intimate events and special occasions. 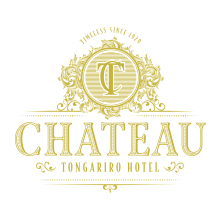 Classic weddings at Chateau Tongariro blend the grandeur of nature with tasteful luxury that brings couples back year after year to celebrate anniversaries and family milestones. Our guests are international and multigenerational, creating their own Chateau Tongariro traditions while sharing our abiding respect for conservation and the local Maori people.